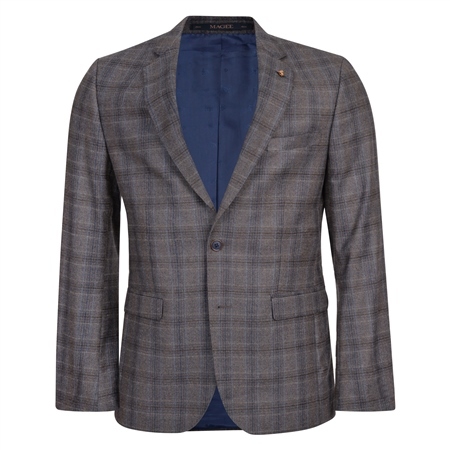 The jacket, trousers and waistcoat fabric is a luxurious brown and blue check in a brown base wool. Style with a Blue & White Bengal Stripe Tailored Fit Shirt and Blue Knit Tie. Jacket - Two-button closure, side vents, outer breast welt, double jetted straight flap pockets, wolfhound lapel pin, and lapel buttonhole, contrast rim kissing buttons, and printed under-collar detail. Waistcoat - 3 single welt pockets. Trouser - Plain front trouser. Belt loops, slant side pockets, double jetted hip pockets and zip fly.